First Colony LID#2 will be moving in some additional equipment and supplies today and over the next few days. This is part of the planning according to our Emergency Action Plan. Please note that this increased activity is not a sign of issues with the Levee System. There is still a voluntary evacuation order effective indefinitely until further notice by County officials. The river peak crest is currently forecast to occur on Aug 31 around 7pm. Stay safe and continue to monitor situations. The Brazos River appears to be cresting in San Felipe but there is still a good amount of water finding its way into the Brazos River downstream of San Felipe. At 3:50 PM, the NWS forecast continued to show Gage Elevation 57.5’ in Richmond. The peak has shifted and the forecast is anticipating the crest to occur on Friday Morning. The District continues to run a 24/7 operation of the pump station. The levels in the internal system have been lowered approximately 14 inches at the pump station since last night and are continuing to fall as we get a break from the severe rain. In addition to the pump operations, the District will initiate their 24/7 levee patrols. As outlined in the District’s Emergency Action Plan (EAP), the District will be inspecting the condition of the levee during the event. During this time, you will see increased activity on the levee starting tonight. Please note that this increased activity is not a sign of issues with the Levee System. 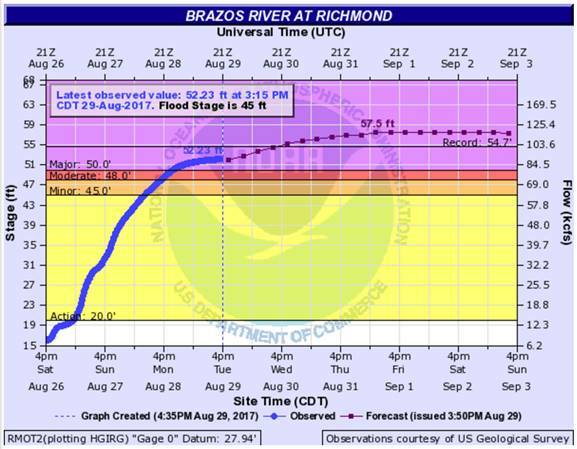 This planned, precautionary measure will continue for as long as needed until the Brazos River recedes.